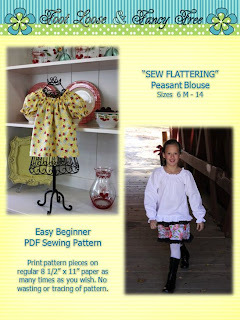 Foot Loose and Fancy Free Boutique: "Sew Flattering" Peasant Blouse Pattern - Now Available! "Sew Flattering" Peasant Blouse Pattern - Now Available! This flattering peasant style blouse with ruffled neck and sleeves will be the staple of your child’s wardrobe. Make it long, ¾ or short sleeve for all seasons. This pattern has a scooped neck, an aline shape and a flattering fit. The ruffles are single edged fabric to give it an airy look. You can either hem or serge the ruffle edges. Instructions are given for both shirred or elastic cased neckline and sleeves. Make it with the bottom ruffle to wear on the outside of skirts or jeans and make it plain bottom to wear under my pillowcase dresses or jumpers. This downloadable pattern has 85 color pictures and has a total of 68 pages of step by step instructions and pattern pieces. The pattern pieces are divided into 2 groups of sizes 6M-5 and 6-14 for clarity and ease of taping pattern pieces together. You only have to print and tape the size group that you need and cut on color coded lines. When you need another size just simply print pattern again. No wasting of tissue pattern or timely tracing of pattern.